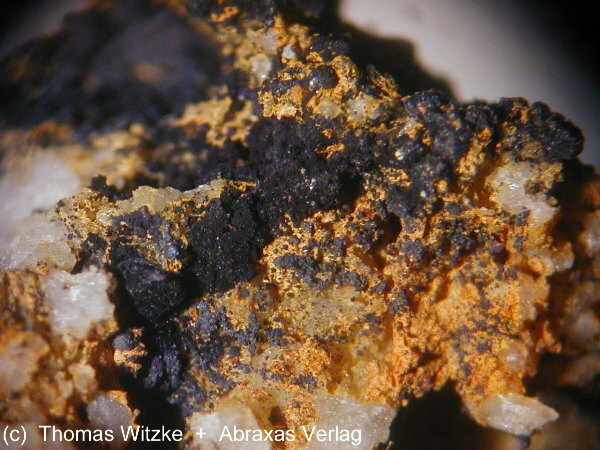 Asbolane: Mineral information, data and localities. Named from the Greek "to soil like soot". 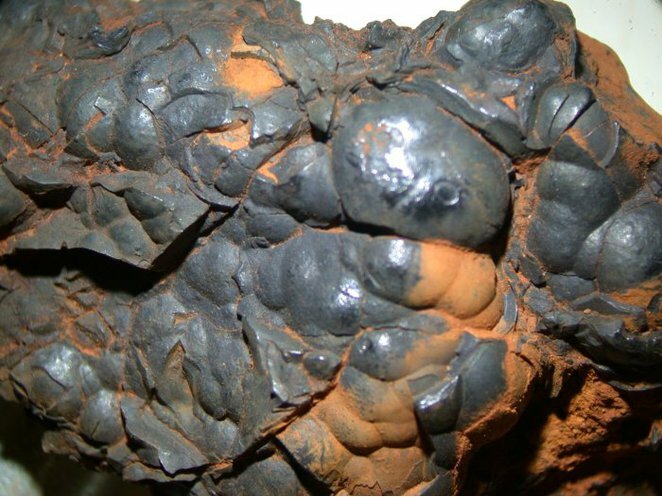 A poorly defined material, usually defined as cobalt or nickel-bearing "wad". An alternate formula sometimes given is (Ni,Co)2-xMn4+(O,OH)4 · nH2O. The chemical composition is highly variable and can contain large amounts of Ni, Co, Cu, Mg and other metals. It is a mixed-layer mineral with layers of Mn-O octahedra and of other metals mostly in separate layers. It should be defined as a group. Cuproasbolane Presently defined as a Cu-bearing variety of aAsbolane and a synonym of lampadite. Can also be considered a cobalt-bearing wad. Potentially an actual species but requires better definition. Originally described from Katanga (Shaba), Congo (Zaïre). Erythrite 4 photos of Asbolane associated with Erythrite on mindat.org. Crocoite 3 photos of Asbolane associated with Crocoite on mindat.org. Quartz 3 photos of Asbolane associated with Quartz on mindat.org. Azurite 3 photos of Asbolane associated with Azurite on mindat.org. Takovite 3 photos of Asbolane associated with Takovite on mindat.org. Malachite 2 photos of Asbolane associated with Malachite on mindat.org. Allophane 2 photos of Asbolane associated with Allophane on mindat.org. Conichalcite 2 photos of Asbolane associated with Conichalcite on mindat.org. Agardite-(Y) 2 photos of Asbolane associated with Agardite-(Y) on mindat.org. Birnessite 1 photo of Asbolane associated with Birnessite on mindat.org. Palache, C., Berman, H. and Frondel, C. (1944): Dana's system of mineralogy, 7th ed., Vol. 1, 566, 568. Chukhrov, F. V., Gorshkov, A. I., Vitovskaya, I. V., Drits, V. A., Sivtsov, A. V. and Rudnitskaya, Y. S. (1980): Crystallochemical nature of Co-Ni-asbolan. Izv. Akad. Nauk. SSSR, Ser. Geol. 6, 73-81 (in Russian). - Mineral. Abs. (1981) 32, 322 (abstract). - American Mineralogist (1982) 67: 417 (abstract). Chukhrov, F. V., Gorshkov, A. I., Vitovskaya, I. V., Drits, V. A., Sivtsov, A. V. and Dikov, Y. P. (1980): Crystallochemical nature of Ni-asbolan. Izv. Akad. Nauk. SSSR, Ser. Geol. 9, 108-120 (in Russian). - American Mineralogist (1982) 67: 418 (abstract). Llorca, S. and Monchoux, P. (1991): Supergene cobalt minerals from New Caledonia. Canadian Mineralogist 29, 149-161. Manceau, A., Gorshkov, A. I. and Drits, V. A. (1992): Structural chemistry of Mn, Fe, Co and Ni in manganese hydrous oxides, part II: Information from EXAFS spectroscopy and electron X-ray diffraction. American Mineralogist 77, 1144-1157. Anthony, J. W. et al. (1997): Handbook of Mineralogy, Vol. 3, 26. Day, B. E. & Beyer, B. D. (1996): Some mines of the Mt Isa district. Part 3 - The Mt Oxide mine. Australian J. of Mineralogy 2 (1), 3-10. Putzolu, F., Balassone, G., Boni, M., Maczurad, M., Mondillo, N., Najorka, J., & Pirajno, F. (2018). Mineralogical association and Ni-Co deportment in the Wingellina oxide-type laterite deposit (Western Australia). Ore Geology Reviews. Niedermayr, G. et al. (2008): Neue Mineralfunde aus Österreich LVII. Carinthia II, 198./118., 223-274. GEOBOL, Boletín #11, June 1968. Tamara Gallardo, Esperanca Tauler, Joaquin A. Proenza, John F. Lewis, Salvador Gali, Manuel Labrador, Francisco Longo, Giovanni Bloise (2010): Geology, Mineralogy and Geochemistry of the Loma Ortega Ni Laterite Deposit, Dominican Republic. Macla no 13. septiembre ‘10, Revista de la Sociedad Española de Mineralogía. Dublet, G., Juillot, F., Morin, G., Fritsch, E., Noel, V., Brest, J., & Brown, G. E. (2014). 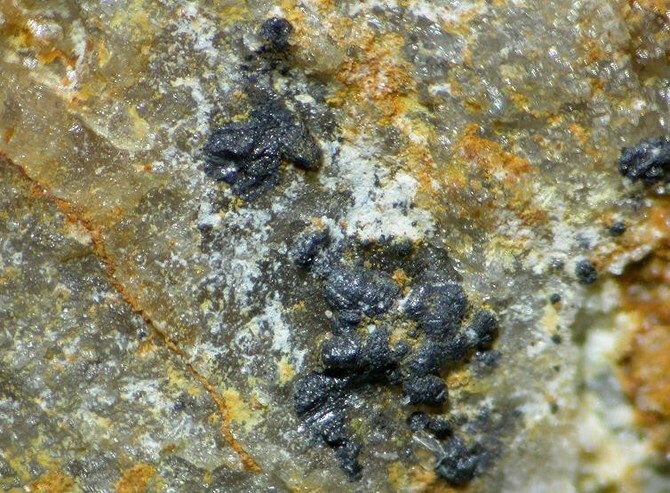 XAS evidence for Ni sequestration by siderite in a lateritic Ni-deposit from New Caledonia. American Mineralogist, 99(1), 225-234. Remy, P., Gatel, P., Meisser, N. (2014): Indice à terres rares de Mosset (Pyrénées-Orientales). Le Cahier des Micromonteurs, 1-2014, 3-17. J. Gröbner: Neufunde von der Grube Katharina im Wildschapbach, Der Erzgräber 18 (2/2004), 34-37. La Valle, G. (1898) Su di alcuni minerali cobaltiferi e nicheliferi nella provincia di Messina. Atti della Reale Accademia dei Lincei, serie 5, Rendiconti, 7, 2° semestre, 68-71.
ⓘ Monte Foscarino south slope (altitude 194 m) ? Forti, P. et al. (2006): ACTA CARSOLOGICA 35/1, 79–98. Wojciechowski, J. (1958): Minerals occurring at Miedzianka near Checiny (Swietokrzyskie Mts., Central Poland). Prace Muzeum Ziemi (No. 1), 133-156. Pedro Alves collection and analytical data. EDS showed very low Ni content and significant Ca and Cu. ARANA CASTILLO, R. (1972) : Investigaciones mineralogicas en Sierra Nevada. PhD report Grenada University. Carne, J. (1822): Transactions of the Royal Geological Society of Cornwall 2, 290-358; Hall, T.M. (1868): The Mineralogist's Directory. Edward Stanford (London), 168 pp. ; Collins, J.H. (1892): A Handbook to the Mineralogy of Cornwall and Devon, 2nd ed., Bradford Barton Ltd. (Truro), 108 pp. Melhase, John (1934), A diversity of many fine minerals available in California for collectors: Oregon Mineralogist: 2(7): 23; Murdoch, Joseph & Robert W. Webb (1966), Minerals of California, Centennial Volume (1866-1966): California Division Mines & Geology Bulletin 189: 299.